Winter is here. Accompanying the cold, the rain, and the snow are a whole bunch of old wives tales that range from slightly inaccurate to downright dangerous. We generally believe these pieces of advice because they were passed down to us by parents, grandparents, and friends. But the truth is, most of these myths come from a misunderstanding of science, or a time when people just didn't know any better. 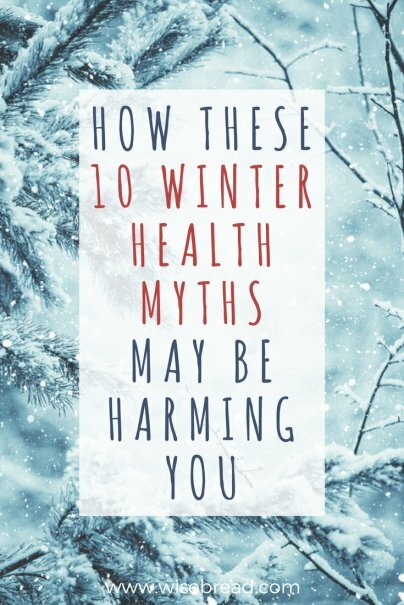 Here are 10 of the biggest winter health myths — debunked. Wrong. Oh, so very wrong. When people feel the drop in temperature (which can be dramatic in some states), they think that the cold weather eliminates the need for UV protection. This is just untrue. "The sun's harmful rays are just as strong and damaging despite what your thermometer says — particularly the UVA rays which are responsible for aging skin," said Bruce E. Katz, the director of JUVA Skin and Laser Center in New York. Now, with the winter months, you may be actively covering up a lot of your skin anyway with thick clothing, gloves, and scarves, but your face will still be exposed to harmful UV rays, and all it takes is one bad sunburn to increase your risk of getting skin cancer. And if you plan on going skiing, remember that the snow reflects up to 80 percent of the sun's rays right back at you, so use a good sunscreen and sunglasses. For hundreds of years, parents and grandparents have told their little ones to bundle up and avoid going outside because it'll increase the chances of catching a cold, or becoming ill. This is pure fiction. The cold weather cannot make you sick in that way, unless you are trapped outside and develop hypothermia. In fact, when you venture out into the cold, the cells that fight infection in your body actually increase. And what's more, according to the National Institute of Allergy and Infectious Diseases, cold viruses thrive at a temperature of 91 degrees. So, why do people think the cold weather brings colds and sickness? Well, there could be several reasons. One theory is that during the winter months, you spend way more time indoors, and heating systems make it easier for viruses to enter your dry nasal passages. What's more, you're spending way more time locked up inside with other people. If one of them gets sick, the chance of that disease spreading is greater than during the summer months. But the cold weather itself is not going to give you a cold or the flu. Military researchers in 1950s conducted studies that exposed subjects to frigid temperatures. Their heads were uncovered, and their bodies were bundled up nice and warm in cold-resistant clothing. These studies probably led to the U.S. Army Field Guide stating that 40-45 percent of heat being lost was through the head. Well yeah, because it's the only part of the body that was exposed during these experiments. A 2006 study repeated the test, but did it with test subjects in wet suits in cold water. Sometimes they would fully submerge their heads, other times the head was left out of the water. The result was that heat loss through the head is proportionate to the rest of the body. So, yes, you should cover your head to keep warm. But you are not going to lose half your body heat if you don't wear a hat. During the winter months, the aisles in the supermarket are stocked with vitamin C boosters and supplements; some offering over 1,600 percent of the daily amount you are supposed to take. Can this massive intake of vitamin C really prevent a cold from forming? Or, can it kill a cold in its tracks? The answer from researchers and scientists is … probably not. Vitamin C has been touted for decades as an essential supplement for health and vitality, and there is no doubt that vitamin C does the body good. It can have a kind of antihistamine effect, and a 2005 study from the European Journal of Clinical Nutrition suggests that it can reduce the frequency of catching a cold, but realistically, bingeing on vitamin C is not going to do much for you, other than having a placebo effect. My parents were guilty of believing this little myth. They would put a capful of whiskey in their tea or coffee, saying it would help them stay warm before going out in the cold. The effects of the alcohol may be tricking your body into feeling warmer, but it's not really happening. As the MythBusters proved, alcohol actually lowers your body's core temperature. The heat you think you're feeling comes from the alcohol causing your blood vessels to dilate, moving warm blood closer to the skin, and creating that flushed feeling. This is another myth that comes from a time when people didn't understand the science of body chemistry. The thought was that if you had a cold, food would warm you up. Conversely, if you had a high fever, not eating would cool you down. This is just patently bad medical advice. In both cases, good nutrition gives your body the fuel it needs to fight infections and recover from an illness. When you have a fever, your body is burning energy at a rapid rate, and that needs to be replenished. So, by all means feed your cold; but also feed your fever, or any other illness. Even if you have stomach issues, find a way to take in lost fluids and electrolytes. This is just another myth that stems from cold weather increasing the chance of illness. Your head will certainly feel colder if you go out into the frigid air when it's wet, but you're not going to catch a cold, or the flu, by stepping outside after you just got out of the shower. Of course, you should probably dry it first because you are not going to feel comfortable with a head full of cold, wet hair. And if it's really cold, a hat is a good idea to stop any body heat from escaping. You will only catch a cold if there is a virus going around.